Swimming, boating, and other water sport activities are possible on Lake Geneva while hiking and cycling opportunities abound on its shores. For skiing and winter sports head to the nearby Alps and Jura. Lake Geneva (Lac Léman) is the largest body of freshwater in both Switzerland and France. The opportunities for outdoor activities on and next to the lake are almost endless. The weather in the Lake Geneva region is surprisingly moderate for a central European location on the edge of the Alps. Pleasant sunny days are common from May to early November with the lake water temperature high enough for swimming from June to September. Boating in many forms is possible on the water of Lake Geneva. Pleasure boats and passenger ferries ply many routes, especially during summer. Private boating is also allowed and motorized boats can be rented in most larger towns. 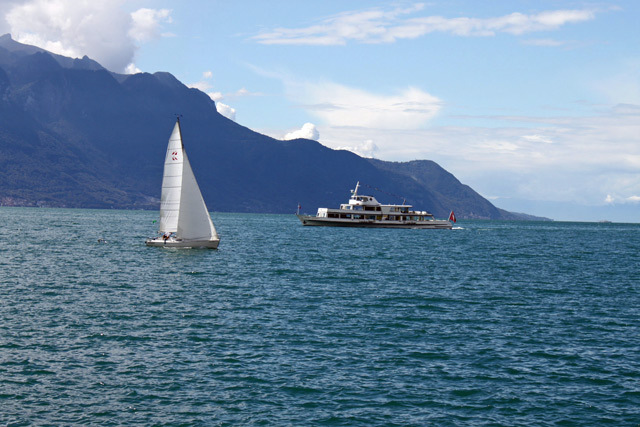 For more active pursuits try pedal boats, canoes, kayaks, windsurfers, or water skiing on Lac Léman. The waters of Lake Geneva are reasonably clean and offer great opportunities for swimming from around June to September. Of the 116 public beaches on Lake Geneva, the water quality at only one was considered unsafe for swimming in 2010. Access is free to most public beaches at Lake Geneva. The few that charge admission generally offer several additional facilities including chlorine swimming pools and better changing facilities. Many beaches have restaurants and picnic facilities. Aquaparc, a large water and slides fun park near Villeneuve on the far eastern end of the lake, and open year round. It is hugely popular with families. The region also has many hot spring spa resorts such as Leukerbad in the Valais valley. Cycling in the Lake Geneva area is a pleasure with many dedicated cycling routes or cycling lanes on the sides of public roads. The roads close to the lake shore are generally flat but many challenging slopes can be done inland including difficult trails in the Alps and Jura mountains. It is possible to cycle around Lake Geneva mostly on marked dedicated or fairly quiet routes. The Lake Geneva region offers endless hiking opportunities of all kinds. The larger towns and cities have well-maintained waterfronts, often with large parks that are perfect for casual strolling. Outdoor restaurants and cafés abound. It is easy to stroll from small village to village along Lake Geneva. Good public transportation makes it simply to start the return journey from alternative points. The UNESCO World Cultural Heritage vineyards at Lavaux are excellent for hiking on paved roads with marvelous views of the grapes, mountains, and lake. Further hiking trails go through forests in many smaller communities as well as in the Jura and Alps. The water of Lake Geneva cools down in winter but not sufficiently for the lake to freeze over. However, during winter, many towns have outdoor ice skating rinks, which may often be used for free. Late winter, Lac de Joux in the Jura usually freezes sufficiently to form a huge free ice skating rink. Skates can be rented for a nominal fee. Skiing and other winter sports are possible in the Jura Mountains and the Alps. The mountains in the Rhone Valley in Valais (Wallis) and the French Alps have the best facilities. Warm water spas provide a welcome soak after a hard day of skiing. Many visitors use the resorts in the Jura at a fraction of the price of more famous ski resorts.